Fear based aggression in dogs is probably the most common form of aggression. When a dog feels threatened they may get defensive, if pushed it can turn into aggression. Not all will resort to biting though. Why do dogs display fear based aggression? Most people think that fear based aggression in dogs is because they were abused at some point in their lives, or suffered from some other type of traumatic event. But chances are, that isn’t the case. Most likely the the reason your dog is showing fear based aggression is that he was not socialized enough, or socialized improperly. Dogs that were improperly socialized, especially as a puppy, have a harder time accepting new experiences as an adult dog. They may show signs of fear and fear based aggression by holding their heads low, wrinkling their nose, with their lips pulled back showing many teeth. They often have their ears back and pinned to their head, hackles raised, tail tucked and body lowered. Some dogs will start panting fast. If this isn’t the way your dog is acting, then it’s probably not fear based aggression that you’re dealing with. Many triggers can cause a fearful response from a dog. Being approached by people or other animals is a common one. Dogs can even show a fearful or excessively submissive response, even to people they’ve know all of their lives. Usually because a lot of people greet dogs in a very threatening to the dog, manner. Think about it, people get excited about seeing dogs. They rush forward, towards the dogs, making eye contact and reaching towards them. Often talking in an unnaturally high pitched voice, and leaning over the dog. If you were a smaller creature. don’t you think that would be enough to scare you? Even confident, well socialized dogs will exhibit nervous behavior when approached this way. They’ll lick their lips, turn away, or avoid eye contact. If a dog hasn’t been around children much, then children can cause fear based aggression. Or even if they have been around children, if a child approaches them as described above, they may display aggressive behavior. Or when people let their children poke and pull at dogs tails, or eyes. Loud noises, or unusual noises can cause a dog to become fearful or aggressive. We once had a truck wreck and land upside down in our yard, while the dogs were outside. Talk about scared dogs. Even our dogs who are used to hearing lots of gun shots from neighbors target practicing, life flight helicopters flying low overhead, and all kinds of motorcycles, dirt bikes and ATVs ripping around the property, were frightened by the noise the truck made as it crashed into a tree and rolled over. Luckily, they did as taught when a loud noise approaches, by running to the door to be let in. The vet’s office is another common place for dogs to show fear based aggression. Think about it, the vet is always poking and prodding them. Lifting their lips, looking in their ears. Even our Chewy, who is a pretty gentle dog, sometimes has to be muzzled to get through his vet exam. Although since we’ve changed vets, and he’s fallen in love with the one tech at the new office, he hasn’t had to be. I think he would follow her anywhere, and not care about leaving mom behind. Approaching a fearful aggressive dog must be done carefully to avoid a a nasty bite. Once a dog learned that teeth motivate people, it can be difficult to teach them otherwise. 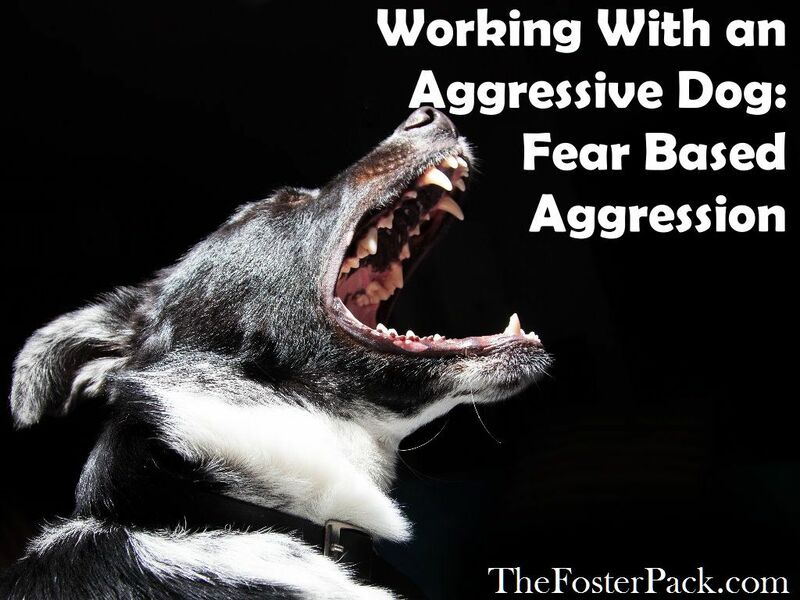 When your dog starts to display aggression out of fear, it’s not a challenge or a threat to you. He’s warning you to stay away, or to get him out of that situation. Heed his warning to avoid a bite. First off the most important thing to remember is to stay calm, and avoid eye contact. When a dog sees you tense up, it confirms in his mind that there is something to fear. Don’t comfort, it only reinforces the dog’s belief that he has something to fear. Don’t turn your back on a growling fearful aggressive dog. Turning around and presenting your back to a growling dog is an invitation to be bit. If the dog is not your own, or you don’t have your dog on a leash when he starts growling, back away slowly. Avoiding eye contact still, look to the side, but keep the dog in your vision. They will also bite if cornered. Try to catch the signs of fear your dog exhibits before he gets to the growling and snapping phase. Dogs give many signals when they are uncomfortable. These signals are often called displacement behaviors, or calming signals. They are very subtle, and many of them are either missed or misinterpreted. Head turning – The turn can be to either side, right or left. It can occur quickly then he looks forward again or the turn can be prolonged and held. Squinting – This is a way of looking in the direction of something, someone, or another dog without making eye contact. Turning away – This is just a further progression of head turning that involves turning of the entire body. Licking his lips or nose – This will be quick, often missed, and is very common. Walking slowly – Movement continues here, but they move in slow motion and very deliberately. Sitting or lying down – Either with or without giving you his back. Yawning – Most people associate this with being tired. Sniffing – Sudden sniffing either of the air or a spot on the ground. Yes, dogs like to sniff things, but in the context where something is making them uncomfortable, it is displacement behavior. An arced approach – A direct approach is more of a challenge or assertion of status. A C-shape or arced approach is less threatening. Lifting of a paw – This is often used in conjunction with other signals, either while sitting or standing. Tomorrow we’ll talk about how to work with a fear based aggressive dog.